Jorge Lorenzo rode half of the second practice session at Brno today with a new, downforce fairing on his factory Ducati. 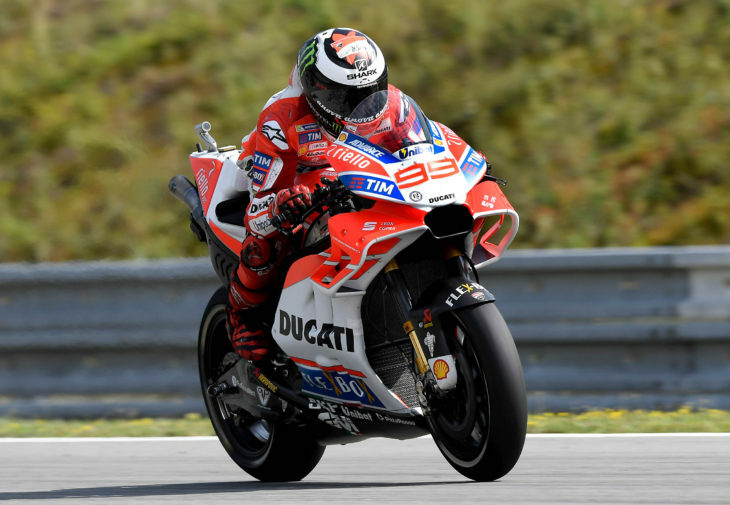 With relatively few laps on the design, Lorenzo offered it has “potential”, but needs a lot more testing. Lorenzo ended practice 2 a lowly 15th on the time-sheets. Weather was mixed today with practice 1 wet, and practice 2 a drying track. The forecast for tomorrow indicates a likelihood of dry weather, with Sunday (race day) showing a roughly 50% chance of rain. Stay tuned for Brno MotoGP coverage on MD. He might have been 15th in practice, but he’d have loved to be there in the race. Its appearance doesn’t bother me one bit. Just consider the winglets on the Kawasaki Ninja H2R. As has been said, form follows function. And I’m all for functional innovation, no matter how unusual the appearance. Remember Vetter’s Windjammer for street use? Even though it was just a restyled version of what had existed in Europe for years, perhaps decades, it still became a big hit in America. Fairing innovation has progressed very little since way back when dustbins were outlawed from competitive racing. And having ridden behind various fairings for the last 45 years, and still doing so, I wouldn’t mind some fresh innovations in that department. I am reasonably neutral, except concerning safety. If they prove to increase the probability of getting harpooned by “shrapnel” after a crash or if they cause unsafe levels of turbulence for the riders behind, then I am a no vote. Other than that, beauty (or lack thereof) is in the eye of the beholder. Ah guys, this down force fairing is not new. Any of you readers old enough to remember the Britten? The various Brittens all managed to still look awesome. This looks like a molded turd. But I hear they do race lawn tractors – just in a different class. Uh-h-h, have you looked at an Indycar or F1 race car lately? Splitters, canards, spoilers, deflectors everywhere. Not pretty, but I guess they do work aerodynamically. Cool! I’m going to put this on my bike. And playing cards in the spokes. Fashion is a fickle mistress. If this actually works (the evidence over the last year suggests it does) and offers advantages to bike stability then the teams will continue to try and use them in some form or another. As long as they are safe the rules will eventually change to reflect this. In six months the same people saying how ugly these fairings are will be fitting after-market versions on their own rides. You can’t see this in the Ducati Scrambler accessory catalog? Gotta love that Jorge has basically been relegated to test-mule status now for Ducati. What, was Michele Pirro so busy shagging #99’s crumpet that he couldn’t be arsed to climb out of the mobile home long enough to go perform his test-rider duties? What matters is if it gives better performance, not if it looks better. If it improves the stability of the bike in racing without costing top speed, etc., then all the other brand bikes will follow if they see a need. What was the deal with the “wings” rules? Looks like a variation of the concept. These new ones aren’t “stuck on” like last year’s versions. it’s “transformed” from hammerhead to MANTA RAY. oh i’m on it pal. Does this fairing make me look fat? 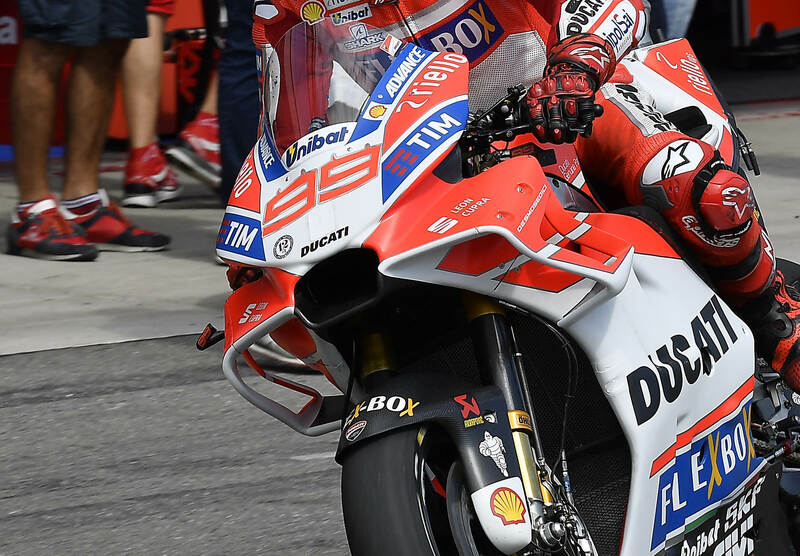 But Dovi wasn’t using the new fairing. Q: form follows function or function follows form? The next time I use a puke emoji in texting apps, it’ll be a picture of that front end.